When you logged in on your Facebook account your online status is shown to your friends and they start chatting with you. It’s not easy to ignore them at this time you need to known can i hide online status on Facebook chat? The answer of this query is Yes. You can easily hide your online status on Facebook account with unwanted friends. Here’s we discuss a simple tip which helps you to quickly hide your Facebook online status. All we know that Facebook is very popular social networking website which allows you for instant messaging. Facebook is the most popular free to use social networking websites which allows you to create user account. You can add friends, create profile, share pics, videos, connect with friends, watch videos etc.. When you logged in Facebook account you will get list of all online contacts. Now you can easily start chatting with your friends and others. To quickly hide your online status on Facebook with your friends, family members. This trick allows you to easily hide online status on Facebook chat. Step 1: First you have to open your registered Facebook account. Step 2: After log into the Facebook account click on the gear icon. It is located at the bottom right corner of your active Facebook window. Now you can check lot of available options in Facebook chat window. Step 3: Click on the Turn Off Chat option. Choose any required option to turn off chat with contacts and click on the Okey button. Turn off chat for all contacts: Choose this option to turn off chat window with all contacts. Turn off chat for all contacts except…: You can choose this option when you want to turn on chat with all the friends except few unwanted friends. Turn off chat for only some contacts: If you want to turn on chat only for few selected friends, then use this option. 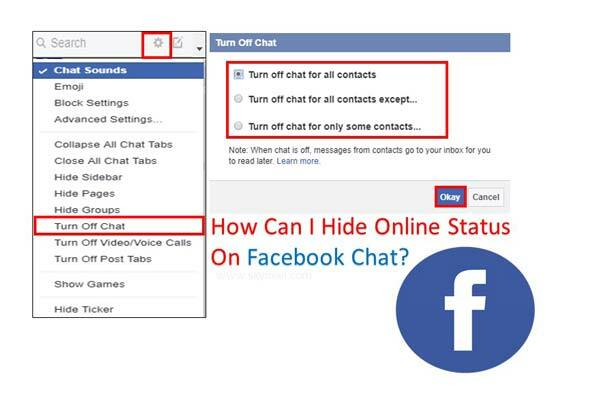 I hope after reading this guide you can understand how to hide online status on Facebook chat. Now you can easily surf with your Facebook account and no one can check you are online or not. If you have any suggestion regarding this guide then please write us your suggestion in the comment box. Thanks to all.